Countryfile spin-off series unveiling the secrets of spring. Keeley Donovan's on the shores of Loch Ness finding out about a cutting-edge trial by the ambulance service. Margherita Taylor’s in the Yorkshire Dales in the tiny picturesque village of Hudswell. With house prices soaring in the countryside, it’s getting harder and harder for villagers to stay put in the very communities in which they work and have grown up. Properties in this area of Britain can fetch £400,000 – way beyond the pockets of locals, whose average income is around £28,000. Hudswell is benefitting from a charitable windfall and Margherita meets a young family who have been able to stay put as a result. A few miles away in Spennithorne she checks out discounted homes which are helping villagers avoid the property pinch. 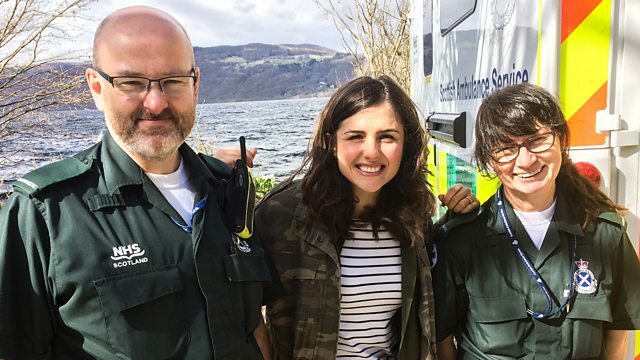 Keeley Donovan’s on the shores of Loch Ness in the Scottish Highlands finding out about a cutting-edge trial by the ambulance service. Space age satellite technology could save lives in one of the most remote areas of Britain where patients can be as many as five hours away from the nearest hospital. By beaming images and details to medics in hospital casualty, life-saving decisions can be made on the spot. Not only are the A+E team fully prepped knowing exactly what to expect when the patient arrives, but also the paramedics can deliver some treatment en route. From burying terracotta pots to help bumblebees to allowing some of your lawn to go wild, Paul Martin is on a mission to discover what we can all do to protect our native wildlife from extinction. The statistics are frightening: two hundred birds on the watch list –sparrows and starlings amongst them – the hedgehog population has virtually halved in the last decade, honey bees are in trouble…. But it’s not too late if we all go to the rescue. Whether you have a sprawling garden or a patio, backyard or balcony, Paul picks up some clever tricks from the Wildlife Trust including a nature reserve in an old seed tray for those of us with just a windowsill. The Wye Valley is famed for being home to the birth of tourism. This week however it’s a rather more thrill-seeking pursuit that’s on the cards as Ellie Harrison will be getting harnessed up and ready for a right rocky adventure! On the banks of the River Wye sits the village of Symonds Yat, home to a whopping eight hundred challenging climbing routes. With the help of expert climber Sven Hassall, Ellie Harrison will be taking on a feat that only 1% of climbers have ever achieved! In her final report with the wildlife rescue squad in North Somerset, Margherita meets some of the most timid orphaned animals which need the gentlest of care or they could literally die of fright. While most patients here at the Secret World Wildlife Rescue Centre will be released back into the wild, Margherita learns why two rather special animals will never be able to leave. And there’s good news for a hedgehog found in a sorry state in a Bath garden. With a clean bill of health, he’s now heading back home where three year old Mia is poised to give him all the help he needs to get back on his feet.